Baseball centers around the (seemingly) eternal struggle between pitcher and batter, and each uses physics, albeit intuitively, to gain a slim advantage over the other in determining the fate of the game's center of interest -- the ball. When you pick up a baseball, it immediately suggests its purpose: to be thrown fast and with considerable accuracy. 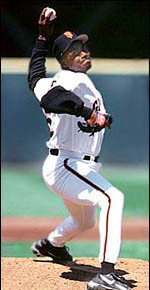 The pitcher, with his dance-like windup, prepares to do exactly that by transferring momentum from his body to the ball. To appreciate why this is necessary, try throwing a ball without moving your feet; it's difficult to throw it very far or very hard, but a forward step makes throwing much easier. So during the windup, the pitcher moves his entire body weight back behind the pitching rubber. Then he thrusts it forward to deliver the pitch. This transfer of momentum from body to ball involves a biomechanical principle called sequential summation of movement. According to this principle, the largest body masses move first, followed by progressively smaller ones, in much the same way a multi-stage booster rocket jettisons a satellite into space: the large booster starts the process, is jettisoned, then is followed by the burning and jettisoning of progressively smaller and faster stages, until finally the small satellite is released at high speed. In baseball, the pitcher drives first with his legs, then his hips, shoulders, arm, wrist, and fingers. As each part approaches full extension, the next part in the sequence begins to move, efficiently transferring momentum in a whip-like action. Proper timing is necessary to produce speed and accuracy, and to avoid strain and injury. A pitcher's body rotates around the foot he keeps planted firmly on the mound. 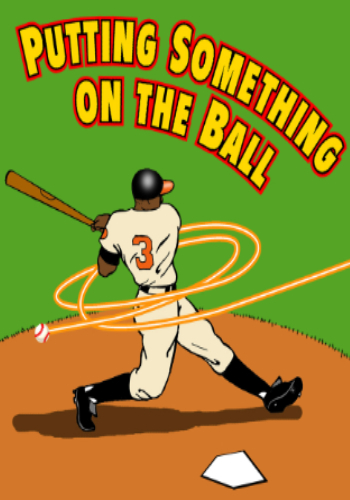 The ball, held overhead in his extended arm, is like a rock whirling on the end of a string. Just as a twirling rock on a long string has more angular momentum than the same rock on a short string (that is, it's more likely to travel farther and faster), the ball in the hands of a tall pitcher can be launched with more speed. 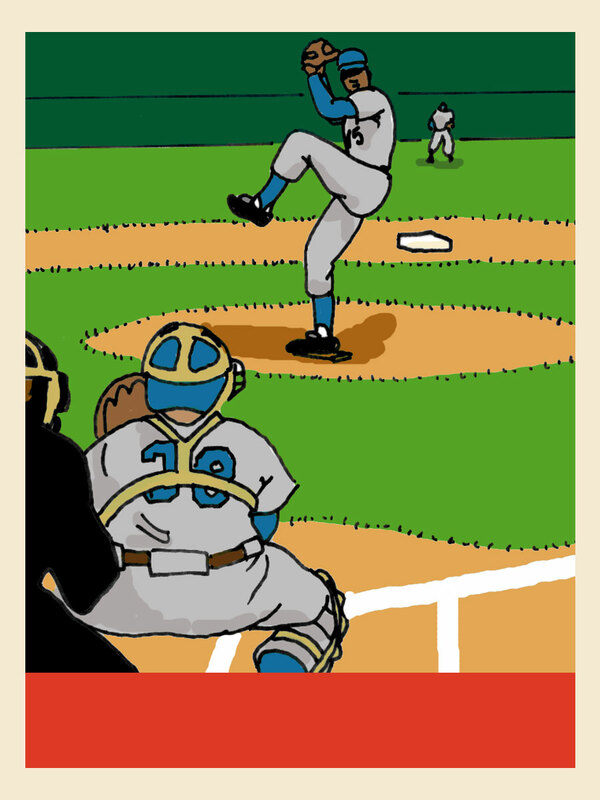 (Fastball pitchers are traditionally lanky fellows.) And since the pitcher actually steps downhill, moving off the crest of the mound as he throws the ball, the height of the mound also affects the force of the pitch. Baseball Aerodynamics 101, or "Hit This!" By varying grips, wrist spins, and pitching motions, the pitcher can make the ball curve, rise, drop, change speeds, or just plain GO FAST. Speed is the most important aspect of the pitcher's game, and "go fast" is what a hardball is designed to do. The raised red cotton stitching that holds the cowhide covering of the ball together serves more than just an ornamental function. Without it, the ball wouldn't travel as far or as fast. When the ball is airborne, the stitching disturbs the boundary layer, the paper-thin layer of air closest to the surface of the ball. As the ball spins, some of this slightly turbulent air rotates with the ball. The best way for the pitcher to transfer the whip action of his wrist and arm into straight-ahead, no-nonsense velocity is to throw the ball overhand, with the index and middle fingers placed close together on the seams of the ball. Now, if the pitcher snaps the ball down and to the side as he releases it, thus giving it a spin, something altogether different results: a curveball. One of the niftiest tricks up the pitcher's sleeve is the ability to make a ball curve, or break, in a variety of directions. When the ball spins at the proper speed around its vertical axis, the passing airstream exerts a deflecting force, caused by the rotation of the ball. Air travels with the spinning ball and is ejected on the opposite side of the spin (see diagram). Since we know that every action has an equal and opposite reaction (thanks to Mr. Newton), the ball is deflected in the direction of the spin, causing the ball to curve. And by controlling the direction of the spin, you control the direction of the curve. The everyday "pretzel-bender" curve is thrown with a good snapping spin down and to the right (for a right-handed thrower). The axis of spin is tilted, so the ball curves down and away from a right-handed batter. Since the ball breaks on two different planes at once, it's much harder for a batter to judge its trajectory. The screwball is a curve ball that breaks in the opposite direction. The wrist and fingers are snapped in toward the pitcher's body, so the ball curves in and down to a right-handed hitter. The slider, or "nickel curve," is thrown harder than a normal curve, with the wrist cocked at a 90-degree angle -- not unlike a spiral football pass. The movement is slight, but the effect is devastating. The batter's difficulty in adjusting for the small curve at the end of the ball's flight makes for weak pop-ups and ground balls -- easy outs. When the slider first appeared in the 1950s, batting averages plummeted. 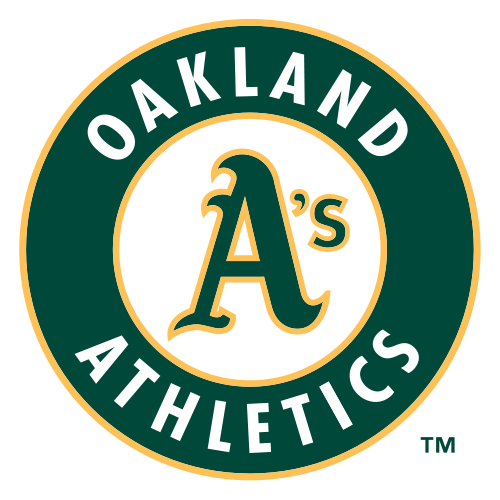 Corrective action was taken by lowering the pitcher's mound and creating a smaller strike zone, but this has not totally neutralized the slider's nastiness. Just when and where a ball starts its curve is affected by the speed at which it is thrown. At low speeds, the flow of air over the front surface of the ball is smooth, but turbulence develops toward the back, where the smooth flow breaks away. At high speeds, on the other hand, the layer of turbulence is distributed evenly all over the front surface of the ball. But as the ball flies through the air, it slows down; at a critical moment, the turbulence in front is suddenly replaced by a smooth flow. If the ball is spinning, this critical moment will occur an instant sooner on the side moving away from the direction of flight. Since the ball's propensity to curve depends upon a layer of surface air being carried around the ball, this process is initiated on the side with more smooth air and delayed on the side with more turbulence. The onset of the curve is thus quite sudden. How well can pitchers control the critical speed factor? Some control it very well indeed -- the late, slight break of the slider is what makes that pitch so effective, and speed is the key. What looks like a fastball actually slows down enough to start curving just inches in front of the plate. The Knuckleball: "I Don't Have Any Idea Where It's Going Either"
The most mysterious pitch in baseball is the knuckleball. It's a hard pitch to master, and its behavior is unpredictable. Tom Candiotti, celebrated knuckleball pitcher, describes it this way: "It's a strange pitch. You throw the pitch so there's little or no spin at all to it. And I guess when you do that . . . when you throw a ball that has little or no rotation on it . . . the ball . . . I don't know if it's wind or something . . . but it makes it move certain ways -- up, down, around. Sometimes you throw it in circles." The ideal knuckleball rotates about a quarter of a revolution on its way to the plate. Without the stabilizing gyroscopic effect of spinning, the ball becomes aerodynamically unstable, and the raised seams create an uneven flow of air over the surface of the ball, pushing it one way or another. Famed hitting instructor Charley Lau claims, "There are only two theories on hitting the knuckleball. Unfortunately, neither of them works." But it is a tough pitch to throw, and because the ball moves so slowly, if it doesn't "knuckle," it's more than likely to end up in the bleachers. The knuckleball effect can be achieved with a simpler and more reliable, though illegal, pitch: the spitball. If the pitcher adds a little dab of spit, vaseline, soap, slippery elm juice, or whatever to his fingertips, the pitched ball will squirt out of his hand like a watermelon seed, with a minimum of spin but a maximum of effect: upon reaching the plate, the ball can suddenly drop up to two feet. Once widespread and successful, spitters were outlawed in 1920 due to their unsanitary nature, and in that year Babe Ruth hit almost twice as many home runs as he had the year before. Some pitchers pride themselves on getting away with this illegal pitch, daring umpires to find where they are hiding the gunk that they somehow manage to transfer to the ball just before they throw it. Consider, also, the plight of the batter. In essence, he's given a round bat, pitched a round ball, and is somehow expected make a square hit. Pitcher Jim Poole sums it up this way: "Part of the key to our game is to keep giving the hitters different appearances of the ball. Some go straight down, some fade away, some go in." Faced with such uncertainties, batters, like pitchers, may also use physics to alter their tools and better their odds, sometimes illegally. Batters, for instance, may put cork, superballs, or tubes of mercury in hollowed-out bats to surreptitiously alter their center of compression or center of mass. The pitcher, on the other hand, may have scuffed the ball on a belt buckle or ring to change its aerodynamics. At one time, teams put balls in refrigerators before games to make them less elastic when the big hitters came to town. In the final analysis, it still comes down to the pitcher, the batter, and their individual abilities. As Bob Veale, who played for the Boston Red Sox, once observed, "Good pitching will beat good hitting anytime...and vice-versa." Pitcher Alvin Morman shows his stuff. The ball on the top is smooth. The one on the bottom has a rough surface, like that created by a baseball's stitches. The ball with the rough surface has less drag and travels more easily through the air. The way a ball curves is determined by the direction and amount of spin placed on the ball, as well as the speed of the pitch. Fastballs usually curve slightly up; curveballs curve down and to the side. Screwballs, with a spin oppposite to that of curveballs, break the other way.